Figure 1. Examples of food waste that occur at each step of the food supply chain (Oliver Wyman, 2014). Food can be wasted at every level of the supply chain: production, processing/distribution, market, and consumption. At stages further down the chain, food waste costs more to the economy and the environment. Food waste at the consumer level costs many times the food waste at the producer level. In developed countries, it comes mostly from households; in developing countries, it occurs during the process of producing, storing, and distributing the food, as viewed in (Figure 2a, 2b). Figure 2a. Comparison of food loss during consumption and production in various regions (FAO, 2013). Figure 2b. Comparison of food loss during various steps of the food supply chain in developing and developed countries (World Resource Initiative, Lipinski et al). Our goal is to decrease worldwide food waste by half in 25 years, which is ten years beyond the US/UN goals. Specifically, we hope that 100% of food waste that occurs in markets and restaurants is used for some benefit, either by successfully transported to local food banks and prepared for the hungry, or by being turned into compost to bolster soil quality or for use in urban farms. We also hope that RFID and other technologies reduce food waste by 20%. Production is the very first step in the food supply chain. During production, crops and animals intended for consumption are grown, cared for, and harvested. Efficiency during production is imperative in order to minimize food losses. Inefficiencies reduce the amount of food available to consumers. Food loss due to natural causes is a major issue mostly in developing countries; in developed countries, food loss during consumption tends to be a bigger problem. Natural causes of crop damage include pests, plant diseases, viruses, and unfortunate weather. Pest and disease outbreaks can eliminate significant portions of a farmer’s crop. Floods, droughts, tornadoes, blizzards, and other natural disasters can wipe out the harvest of an entire region. For instance, Hurricane Andrew, a category 5 hurricane, caused about 250 million USD in crop losses (Kliesen, 1994). Similarly, animal diseases can be dangerously contagious; if not stopped, they can threaten several farms and regions at once (Gunders, 2012). As the climate changes for the worse, natural disasters are expected to increase; they are also unavoidable, and thus food losses due to natural causes can’t be remedied except by increasing production. However, there are damaging farming practices that can be avoided in order to decrease food waste. Over-farming can be an issue in both developed and developing countries. Farmers often wish to create a safety net by producing more than the demand. To them, the risk of not harvesting enough crops – whether due to a bad harvest, or due to an unforeseeable increase in demand – overcomes the cost of planting extra crops. But over-farming is a major contributor to food waste. Producing uneaten crops, according to the University of Minnesota Food Policy Research Center, utilizes “30% of fertilizer use, 31% of cropland, 25% of total freshwater consumption, and 2% of total energy consumption.” (Foley and Reich, 2014). Corporate farms usually overplant by about 10%, and small farmers might plant even more to stay safe (Royte, 2014). Not only does the practice use precious resources, but it causes extra edible crops to be wasted as well. Rather than exerting extra effort and demanding more labor, farmers often find it more cost-efficient to leave extra crops in the field unharvested. The general strategy for reducing food loss and food waste involves prevention, donation, and reuse of waste, as seen in (Figure 3. Any excess food that ends up being produced should either be donated, or be used in other ways: feeding animals, renewable energy, compost, or being recycled, as explained throughout this article. As mentioned previously, a major problem leading to food waste in production is over-farming in order to account for unpredictable weather and supply rises. If all farms grow crops independently of each other, their yields may overlap. Communication and agreements between small farmers regarding the amount and type of crop they will grow allow farms with surplus to make up for farms with shortages (“Global Food Losses”, 2011). At the same time, farmers can agree to diversify their crops for increased harvests in different categories, rather than producing excessive amounts of a single crop. Communities such as farmers cooperatives could help small farms optimize production, pool resources, and minimize waste caused by overproduction. If a farmer decides not to harvest an entire crop, the portion of crops left behind should be salvaged rather than left to rot. More organizations like the Gleaning Food Network should be established; the Gleaning Food Network enlists volunteers and farmers around the United Kingdom to salvage unharvested crops (Learn more about the Gleaning Food Network). Food redistribution allows excess crops to be transferred to those who need them. A store of extra crops accumulates if a farmer does not want to sell fruits or vegetables with superficial blemishes, or if there is more supply than demand. One major obstacle barring farmers from easily donating food is the potential for liability. To amend the legal issue, a “Good Samaritan” law should be put into effect. These laws ensure that people who donate food will not be held accountable should they cause any health problems. One example of this law in action is the Bill Emerson Good Samaritan Act, enacted in the US in 1996. The law “protects food donors from civil and criminal liability if the product they redistributed in good faith to a charitable organization later causes harm to the needy recipient.” (Lipinski et. al, 2013). Other existent laws such as section 170 of the Internal Revenue Code provide tax deductions for large companies, and the laws have also been extended to benefit smaller companies (Food Donation Connection). These laws should be further extended in 5 years to reward farms that donated extra crops, to decrease food wasted at harvest level by 25%. Composting provides another sustainable solution for extra crops. Using compost in fields provides extra nutrients for the soil and increases organic matter, thus improving water retainability and increasing the amount of slow-release nutrients (Rosen and Bierman, 2005). Compost is a tactic for reusing any kind of food waste, even at the consumer level, but if farms create their own compost out of unharvested or excess crops, they would effectively have a way to reduce the food wasted. Other solutions to account for food loss and waste involve other sectors. Improvement in infrastructure and storage practices can allow for an increased and more equal distribution of food. Finally, increasing production will hopefully create greater overall net production. An incredible amount of unsold, “ugly” yet edible foods at restaurants and markets are constantly thrown away. Food that can be fed to the hungry ends up lying in landfills. This problem occurs due to major barriers to donating and recycling food: transportation constraints, liability concerns, insufficient storage and refrigerators on sites and at food banks, as seen in (Figure 4). Also, there are problems in storing and identifying excess food, such as edible foods that go beyond their sell-by dates which could be picked up by a designated local food agency are tossed out. While it is right for restaurants and markets to prevent food waste, donate food to the hungry, and recycle waste, it is also economically beneficial for them to make progress in addressing the issue. Less waste is a result of a good inventory and management, resulting in less out of pocket cost for business in buying supply, storing goods, and processing surplus produces. Furthermore, a business’s efficient food donation program can help it establish a better image in its customers and also help raise the consumer’s awareness. Last, donating food can provide company with tax deduction. By replacing traditional barcodes with radio frequency identification (RFID) tags which provide real-time data and are especially helpful in managing fast-moving goods such as foods, owners of stores and restaurants can improve productivity, make more profits, and limit waste. Many people doubt RFID tags will actually take off. However, today’s ubiquitous barcode, since its first use in the U.S. in 1974, took 15 years to be widely used, and universal standard were developed along the line. RFID can potentially replace barcodes when it is introduced to the public due to its ability to communicate more reliable and detailed data, and also due to the fallen prices for equipment. RFID tags are expected to appear in U.S. grocery stores in 2017, and as they become more popular they should create more awareness among stores and restaurants regarding their waste. The global packing company Avery Dennison which is working on bringing RFID technology to the markets claims that RFID tags can reduce food waste by 20%, saving 22 billion USD globally (Bloom, 2015). Another technology approach is adopting a food waste tracking system such as LeanPath, which has successfully reduced a great amount of food at restaurants and schools where it has been applied (“CalDining: Waste Prevention,” n.d.). Last but not least, companies can start developing their own solutions to cope with their specific waste. For instance, in the past, Walmart had to throw a carton of eggs if any one egg was cracked. Through a new program, every Walmart egg goes through a laser process which etches the egg’s information onto the shell, resulting in an employee easily being able to replace the cracked egg with similar product. It is believed that the new system, once being implemented across the chain stores, could save 5 billion eggs annually. Implementing store-specific solutions within 15 years would make the stores 15% more efficient (Royte, 2014). Liability concerns are one of the major barriers that hold restaurants and markets back from donating food to local agencies. By working together, local food banks can inform the businesses of the laws and procedures that protect donors from getting sued for their good acts (Bill Good Samaritan Food Donation Act in the U.S. is one of those). Local food banks and their donors can form a documented relationship, which can further reduce liability concerns if they ever arise. Furthermore, while a large quantity of foods get tossed out because of sell-by dates which indicates peak performance and freshness of the product, businesses can work with food agencies to create extended edible dates when products that might not be beneficial to the business’s sale image and marketing strategy can be prepared for the poor. A close relationship is also likely to result in better transportation and communication, and facilitate improvements on managing and storing goods. In addition, in many cases, under the authorization of the donor, a trusted local food bank can repack donated bulk-sized quantities of food into household-sized packages so that it can be efficiently distributed to people. A strong link between business and food agency is beneficial to both parties. As for small business owners who don’t know much about current resources, they ought to start with respected food agencies. In the U.S., one leading food bank is Feeding America, which works with over 500 partners across manufacturing, retail, growing, and shipping industries in order to bring surplus food to hungry people. Another is Food Donation Connection (FDC), which works with food service companies in linking donors to local hunger relief agencies. FDC takes charge of maintaining a strong communication between donors and agencies, collecting data, and reporting it. In 20 new report from the Natural Resources Defense Council and Harvard Law School’s Food Law and Policy Clinic says more than 90% of American are tossing food when they shouldn’t be, and 40% of our food supply is dumped every year because of food dating.13, FDC worked with 16000 restaurants and helped with delivering 36 million lbs. of food to the hungry. In the U.K., a group named “Feeding the 5000” cooks high-quality produce that has been rejected by supermarkets and serve it to 5,000 random lucky people. A co-op called “The Fruita Feia (The Ugly Fruit),” established November 2013 in Lisbon, Portugal, has helped farmers sell misshapen local produce that doesn’t satisfy supermarket standards at a discounted price. The store ended up saved 100,000 lb of food in its first year of operation (Royte, 2014). Wealthier countries tend to waste more due to the abundance available. According to the Food and Agriculture Organization (FAO) of the United Nations, over 30% of our total food grown purely for human consumption is trashed (Gustavsson, 2011). 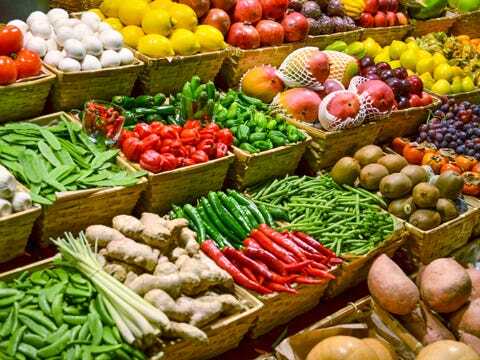 In the United States alone, that’s 162 billion USD worth of food annually, and twenty to forty percent is fresh and completely edible at the time of dumping. The amount of waste per household is directly proportional to household size, culture, and income, and for the overall country to urbanization; in Europe and North America, 95-115 kg of food per year is wasted, over ten times more than the 6-11kg/year from Southeast Asia and sub-Saharan Africa (Gustavsson, 2011). In wealthier, more developed countries, the majority of food waste is created at the retail and consumer level, whereas transportation and storage yields food loss in developing areas (Gustavsson, 2011). Figure 5. (Krasny, 2012) Grocery stores sell fruits and vegetables that appear more attractive to customers. Supermarkets want to sell “pretty” food. That means pallets of fruits and vegetables get thrown out because they are discolored or misshaped. Food retailers typically dump 43 billion pounds of food a year, and although some do have infrastructure in place to donate to local shelters, it doesn’t make a significant difference. Because cheap food is available everywhere, people suffer little to no consequences for throwing food out. On average, a single family in the United States trashes 1,484 USD of edible food a year (National Geographic), and contrary to popular belief, “use by” dates have nothing to do with food safety, but rather about peak freshness. Food waste is expensive for consumers and harmful to the environment. The biggest way we as a developed society can have an impact is to be aware of what we buy and eat. One way we can do this is to support local farmers. Shopping at farmers’ markets reduces waste from large corporations and encourages food consciousness, while also helping consumers receive the most nutritional value out of fruits and vegetables. Local farmers are able to pick their produce the day of or the day before they set up their stand while larger, more expanded companies have to pick their fruits before they ripen so that they aren’t overripe by the time they arrive at their destination. Additionally, the extensive travel experienced by food produced by large corporations increases the risk of being wasted during transit. Instead, small farmers have better communication, avoiding overproduction, and the “imperfect” foods that supermarkets dump out in order to have uniform products don’t have to be thrown out. Another thing that individuals living in developed countries can do to reduce the amount of food waste, is to only buy what one will eat, and only make portions that will be eaten. People should not be tempted by sales and fancy sale techniques; and should instead only buy what they need (Endfoodwastenow.org). Normally, these sales gimmicks don’t end up saving individuals money because that food still just goes to waste. As long as consumers’ awareness increases, producers and wholesale and retails follow and modify their products, operation processes, and behaviors to tailor to their consumer’s needs and wishes. Also, avoiding pre-cut and pre-washed fruit and vegetables is beneficial since they tend to spoil sooner. Another major area of waste comes from not knowing what is in one’s fridge. A way to avoid this is to cycle the older food forward so that one doesn’t forget about it, and also using clear Tupperwares to easily identify what everything is. Governments should encourage their citizens to waste less, and educate their citizens on how to recycle, compost, and at the heart of the issue– understand the effects of waste on the planet. Something governments can do is monitor and tax trash production. Following a South Korean model, another option would be to implement a RFID based trash-scaling system that charges consumer for the amount of their food waste; each household is assigned a card embedded with RFID chip containing the user’s name and address. This card is used to open a neighborhood food waste bin which can then scale the waste’s weight and give out its disposal cost for the consumer. This new system is expected to cut back 670 tons of food waste daily, saving over 17M USD per year. It helps 145,000 users reduce their food waste by 30% (McIntire-Strasburg, 2015). A change that wouldn’t be as radical would be to modify the US garbage system; make recycling trash cans free for all residents, rather than charging for having them. Decreasing the amount of food wasted is an integral part of finding a solution for global food security. Food can be wasted at the production level, the retail level, and the consumer level. During production, efficiency can be maximized by harvesting full crops and by utilizing any surplus crops as donations or compost. Stores and supermarkets can decrease their waste by implementing technology to track the amount of food discarded, and by pushing for government legislation to make it easier to donate unsold food. Finally, consumers should learn about and implement practices to have smaller portions in meals, throw away less food, and purchase only the amount of food they need.